The Culture, Education, and Community Engagement Working Group grounds the AWWC’s work in culture and place. 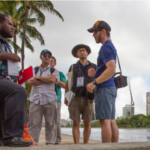 In 2018, the group is working to leverage Hawai‘i’s history of systems-thinking and natural resource stewardship through storytelling to inform planning in the watershed, and connect students and community members to the ʻāina and ahupua‘a. 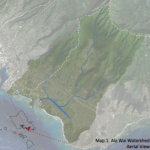 The Environmental Quality, Research, and Science Working Group works to advance existing watershed-wide ecosystem restoration efforts, with a focus on improving water quality in streams and the Ala Wai canal itself. In 2018, the group is focusing on coordinating environmental data-gathering efforts to provide scientific baselines and justification of upstream watershed management. The Policy, Finance, and Infrastructure Working Group works on identifying policy options to enable (green) infrastructure solutions, supported by innovative financing models, including public-private partnerships. In 2018, the group is working with a legal contractor to develop recommendations for establishing a watershed improvement entity and is helping coordinate existing and proposed infrastructure projects in the watershed to align resources and increase efficiencies.